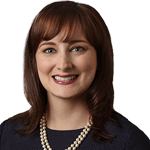 Rachael Welden-Smith joined the firm as an Associate in 2015. Her practice focuses on commercial leasing. Ms. Welden-Smith’s experience includes, commercial leasing, drafting and negotiating purchase and sale agreements, real estate financing and business entity formation. Prior to joining SSL, Ms. Welden-Smith was an associate at Cheifetz Iannitelli Marcolini, P.C., in Phoenix, Arizona, specializing in commercial real estate transactions. In addition, she has served as Of Counsel at The Schinner Law Group in San Francisco.